Tragedy and transcendence in the finale of Poulenc's greatest work. 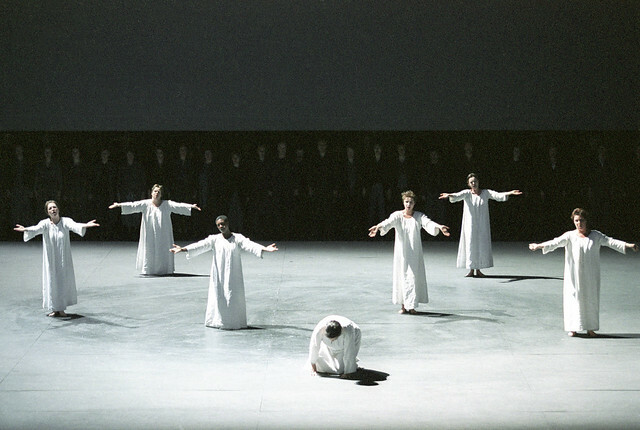 The finale of Francis Poulenc’s only full-length opera, Dialogues des Carmélites, is tremendously powerful – whether you share Poulenc’s devoted Catholic faith or not. His original inspiration (interpreted through several versions by different authors) was the execution of 16 Carmelite nuns and lay sisters from the Compiègne convent. Their beheading, on 17 July 1794, was one of the last and most brutal events of the 'Reign of Terror', and is popularly regarded as a crucial moment in turning public opinion against the Terror's ringleader Maximilien de Robespierre. Poulenc uses every tool at his disposal to make the nuns’ march to the guillotine viscerally terrifying. Both in the preceding orchestral interlude (one of the many in this reflective opera) and the finale itself Poulenc makes rare use of the full force of his huge orchestra. Beneath it all marches a relentless ostinato in the lower strings, an inescapable and unstoppable pulsing minor 3rd. Over this the nuns sing the ‘Salve Regina’ prayer in a simple, chant-like rhythm, recalling the opera's other prayers and in contrast to the speech-led rhythms that dominate otherwise. The nuns sing steadily, matching the tread of the ostinato. But Poulenc creates a hideous sense of anguish, hiking up the pitch with each iteration of the couplets of the prayer, and introducing a sharp increase in volume after the first execution. For worst of all is the unpredictable swish-rattle-thud of the guillotine (an actual replica at the La Scala premiere in 1957, but now most often a sound effect), marked by Poulenc as ‘sourd et lourd’ (dull and heavy). It falls at irregular intervals in terrifying contrast to the steadiness of the nuns’ prayer, snatching away individual singers mid-word in Poulenc’s carefully stipulated score, heightening the aural and visual impact of this nightmarish addition to the orchestra. The remaining four nuns move more quickly through the second verse, aware of their declining numbers, and eventually only one, Constance, the youngest, is left to finish the final line: ‘O clemens, o pia, o dulcis Virgo Maria’ – o clement, loving, sweet Virgin Mary. It is at the end that Poulenc drives home the theology that guides the opera, strongly influenced by the script (for an abandoned film) by Georges de Bernanos that was the composer’s principal source material. Bernanos himself had worked from the novel by Gertrud von Le Fort, which was inspired by the memoirs of a Carmelite who survived the slaughter. Le Fort introduced the character Blanche de la Force, an avatar through which Le Fort analysed her own doubts about faith. Bernanos and Poulenc kept Blanche’s fearfulness, her horror at the joyful Constance’s prophetic prediction that they will both die on the same day, that she was the sole dissenter on the nuns’ vote to accept their fate and go to the scaffold, that she was the only one who ran away, and that she returned. But in place of the anguished death for Blanche we would expect, Poulenc and Bernanos instead grant her grace and transcendence, sparing her the violent mauling at the hands of the frenzied crowd around the guillotine that Le Fort had written. In the opera, Constance breaks off from the prayer as she sees Blanche in the crowd. She smiles and climbs the scaffold, and her light voice is cut off mid word. Blanche, ‘incredibly calm, emerges from the stupefied crowd’. She sings a final Gloria based on alternating major and minor 3rds, softly, over spare orchestral accompaniment and held chords in the crowd. As she sings ‘in saeculorum saecula’ (for ever and ever) she is cut off by the guillotine’s last fall. There is horror in Poulenc’s ending, in the needlessness and cruelty of the nuns’ deaths – but this is not a bitter work. Rather, Poulenc celebrates the Carmelites’ courage, and finds transcendent grace in their terrible deaths. Dialogues des Carmélites runs 29 May–11 June 2014. Tickets are still available.